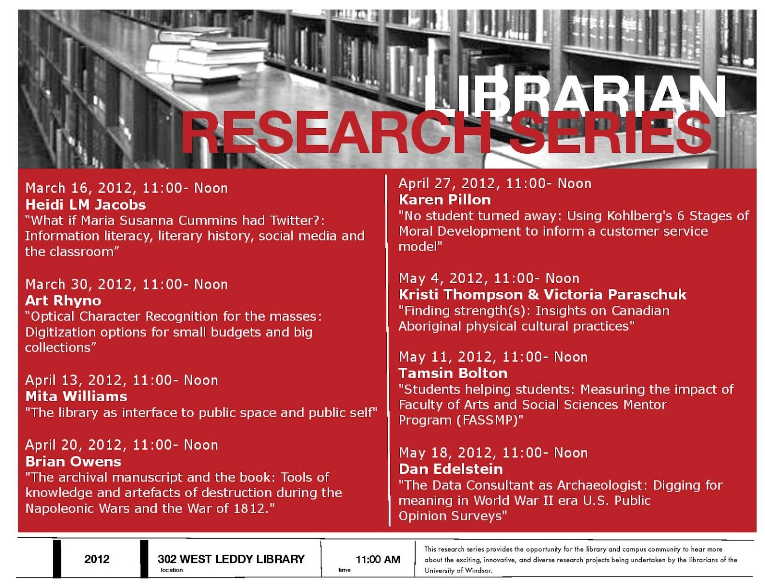 The following are the words and pictures that I presented yesterday as part of the University of Windsor's Librarian Research Series for a talk entitled, The library as interface to public space and public self. This is the first time - ever - that I’m reading a presentation. There are several reasons why I’m reading this one today and, according to what I've written down already, I’ll be sharing one of those reasons. This speaking series was designed to provide those at the Leddy Library with an opportunity to share our research work -- work that we’ve done and work that we hope to do in the future. My presentation today is more about the former than the latter. But it’s worse than that. You see, my intention is to apply for my first sabbatical -- filling in the paperwork this summer -- with the intention of starting it January 2014. At this point, I know what ground I’m interested in exploring but not necessary the particular path that I want to take. 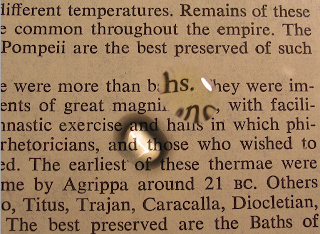 In other words, using a more appropriate metaphor, I feel like I’m at the stage in which I feel I have found a piece of glass that fits nicely in my hand, but I still need to grind it down into a lens. This presentation is my first grindstone. Even without the external motivation of a deadline, I find that forcing yourself to articulate specifically what you really care about and what you want to learn more about is a very helpful exercise in the pursuit of meaningful work. I know this because in some ways I’ve gone through this process before. It happened almost two years ago now. In 2010, I was paid to play a game. 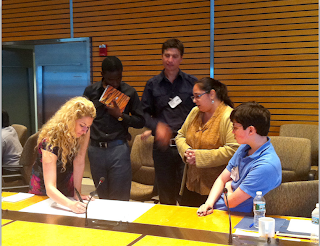 I was a game runner for a game called Evoke that was designed by Jane McGonigal and sponsored by the World Bank. 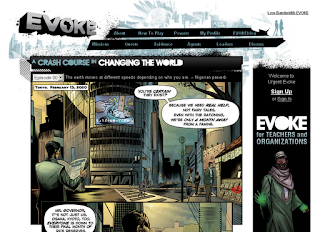 Evoke was an alternative reality game designed to act as a curriculum for social entrepreneurism and during its 10 week run the game attracted almost 20,000 registered players from around the world and raised $30,000 for 25 projects developed by its players. After the game was over, I was invited to go to Washington DC for a couple days to take part in was known as the Evoke Summit for the game’s winners and their mentors. One of the activities that occurred during the summit was dedicated to developing a short tagline to succinctly convey the essence of one’s project. Unlike the rest of participants in the room, I didn’t come to the summit with a particular project, but I did the exercise and eventually I came up with this for myself: public spaces need public events. It has become the tagline that I use on my personal portfolio site and I think it does a pretty good job of capturing some of the work I have been doing inside the library and outside of it. 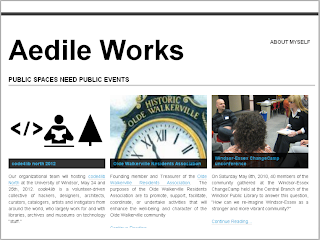 But, being just a tagline, “public spaces need public events” doesn’t explain *why* I think events are so important for libraries, library communities, and communities with and without libraries. I will do that now and I will start with libraries. I believe that events held within libraries animate the space of the library and situates it as a place not just where knowledge is accessed but where it can be created, understood, and shared. Librarians are positioned as perfect hosts of events as we have access to cheap, accessible, and open public space and we are mandated to serve all sectors of our communities. Community events held within libraries embody the notion that libraries are a continual community-building exercise. Libraries, by their very nature, are a gathering of people and ideas mixed together. 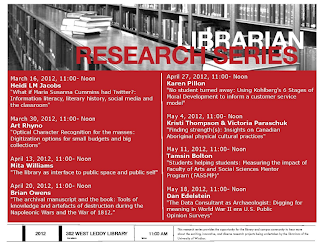 These are some of the ideas that I shared last year in May when I was asked to give a talk at TEDxLibrariansTO. My address there was dedicated to libraries and community events and I entitled my talk Organizing is what librarians do. I will not make you - or me - suffer through the video of my talk, but I will re-read one passage from that day. It’s the call to action part (the genre of the TED talk requires such a call). Now, In that one paragraph I tried to allude to several personal convictions. Today, I would like to articulate the specifics of what I was referring to that day: I believe we are obligated to conserve as much natural habitat and wildlife as possible, that we must continually strive to alleviate human suffering around the globe, and to do so, we need to be engaged in politics and we need to change politics. 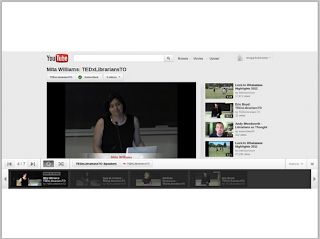 By the way, the theme of TEDxLibrariansTO was “Librarians as Thought Leaders” and that particular tagline was largely misunderstood. There were those when they first heard the theme, thought that the speakers that day were being put forward as “thought leaders”. And while that would be a personally flattering interpretation, I know through conversations I have had with the organizers of the event, that this was not their intention. 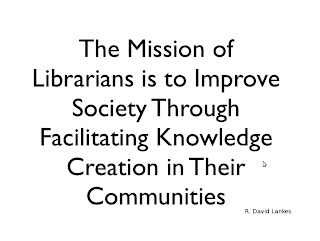 The phrase of “librarians as thought leaders” was designed to challenge our all too common practice of sublimating our work as librarians by constantly to referring ourselves and our work -- in our professional literature, to our own institutions, and to outsiders - as “The Library”. Now, that being said, one could also make the case that we don’t refer to our work -- “librarian and librarian staff work” as “The Library” enough. I like to refer to this particular debate as “The library is the building where the books are” versus “The library is the building where the librarian is”. This conversation is just one of many that form the current re-negotiating and re-understanding of the relationships between librarians, the space the of the library, the collections that they hold and are connected to, and the communities that are served by these things. 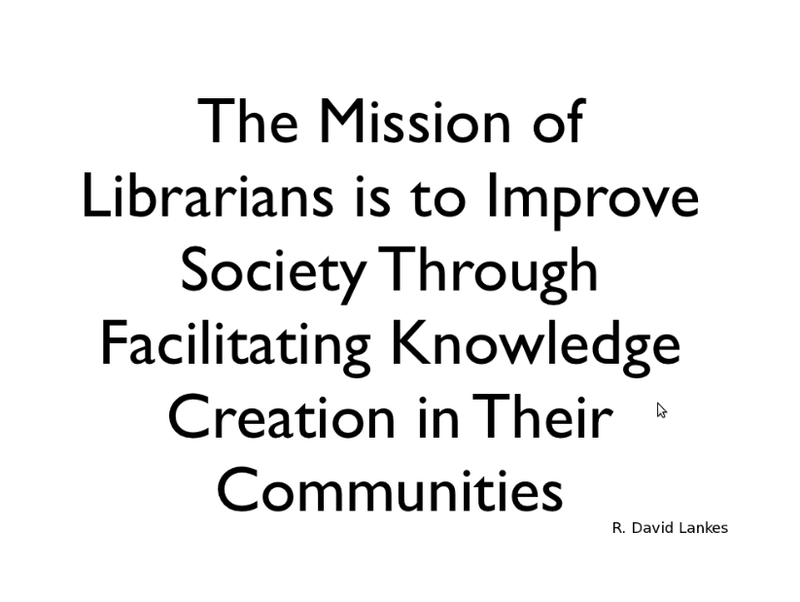 It might be too soon to say this, but I believe we are seeing a great change in librarianship and I want to speak briefly about this change because the work that I’ve done and that I want to do makes the most sense in this framework. The change in question is just a change in perspective, but it’s a powerful one. Instead of the library bringing the world to the community, there are those who are already thinking and working towards how we can bring our communities to the world. 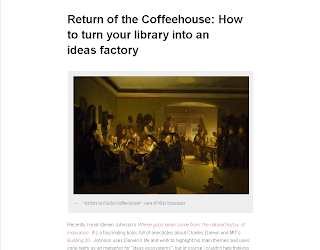 The library becomes the community publisher and an incubator for writer and artists. The library recognizes other literacies and embraces the haptic by hosting hackerspaces where technology is taken apart and examined critically before re-purposed. The library recognizes that communities need to spend time together before it can work together. It provides game space where people can spend time instead of money as they play and learn together. Like the Internet, the library is increasingly seen as a means to communicate and engage instead of just being a locked platform for entertainment and product delivery. 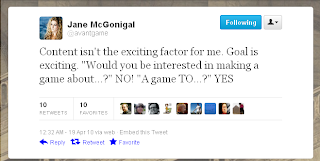 I mentioned Jane McGonigal before. She is a proponent of using games to fix reality, because games make us happy while reality is broken. I love this quote of hers from Twitter and I think that it dovetails what something we sometimes forget about libraries. While libraries are associated with content, libraries were and are created with larger goals in mind: self-education and self-improvement, improving community capacity, and embodying and supporting scholarly communication. The content of libraries isn’t the exciting factor for us. We don’t just exist just to provide information. We strive for literacy, or more accurately in these times, literacies, including information literacy and transliteracy. 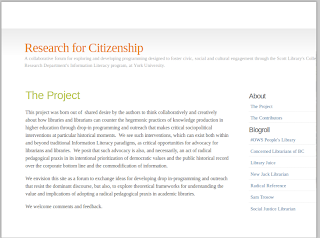 The Research for Citizenship Project by Lisa Sloniowski and Patti Ryan of York University is a great example of this re-interpretation of the library’s potential. So far, this project has involved hosting library based teach-ins and developing research guides dedicated to the Occupy Movement and another surrounding the issue of violence against women in conjunction with campus-based Montreal Massacre commemorative events. Many of you know Lisa Sloniowski from her time here at Leddy Library as Information Literacy Coordinator, when she drafted our Senate-approved Information Literacy Policy and initiated the curriculum integration with History Department and course integration with the English Department’s Composition class. This collaborative project of hers and Patti’s involves information literacy work *in the library* where it emphasizes the research needs of students beyond the classroom where they are not just students but citizens. In doing so, their work facilitates knowledge sharing between students from different disciplines and different communities while making visible the critical work of academic libraries. 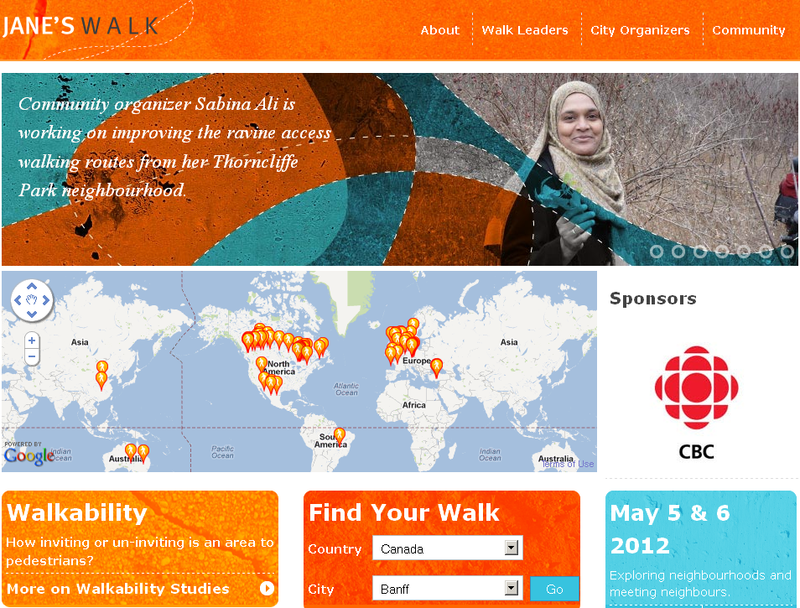 Now, this all being said - I’m no longer completely satisfied with my tagline of “public spaces need public events”. I think it served its purpose by providing a conceptual space for what I’ve done but I now I find it too vague and that it doesn’t really capture the stand that I want to take. I want to articulate goals. 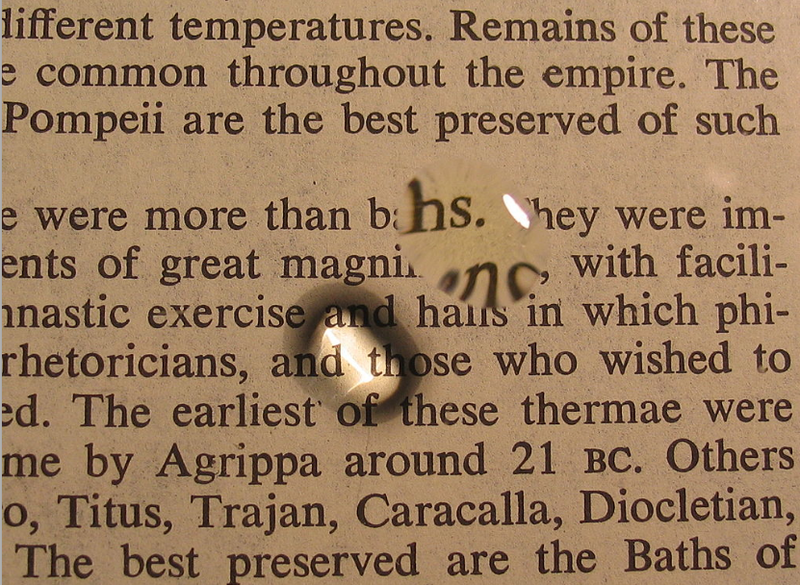 I spoke of lenses before. 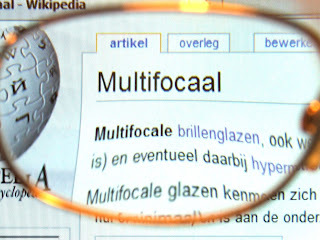 My husband Greg has recently got new glasses with “progressive lenses” - which is a more marketable and more forgiving term for bifocals. When he first got them, he found the two focal strengths terribly disorienting. And I have to admit, that at this particular moment, I’m feeling very disorientated myself, especially with my work. I’ve started to think it’s because I have gotten older, I have started to develop another focus. I’m interested in the same subjects, but I find that I’m interested in them at a different scale. I’m still interested in the work of citizens who come together to improve their communities and their government, but I have found that I’ve been increasingly interested in those ways in which they are using the Internet to facilitate that work. 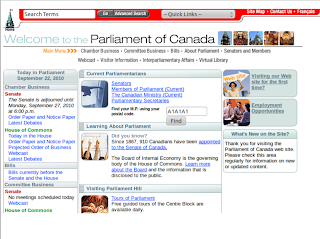 While I have been thinking towards using the library a place for civic engagement and as a support system for democracy, I have been extending that line of thought to consider the library moving from a place where citizens can get information about and from their government, to a place where they can understand, engage and challenge that information. I’ve realized - by preparing for this presentation - that in many ways, what I’m interested in is this interface between the digital and the analog; the bridge between the digital commons and the public common space. As a User-Experience Librarian, I am acutely aware of how important the interface is to an application and how it both demonstrates, embeds, and constrains a value-system. 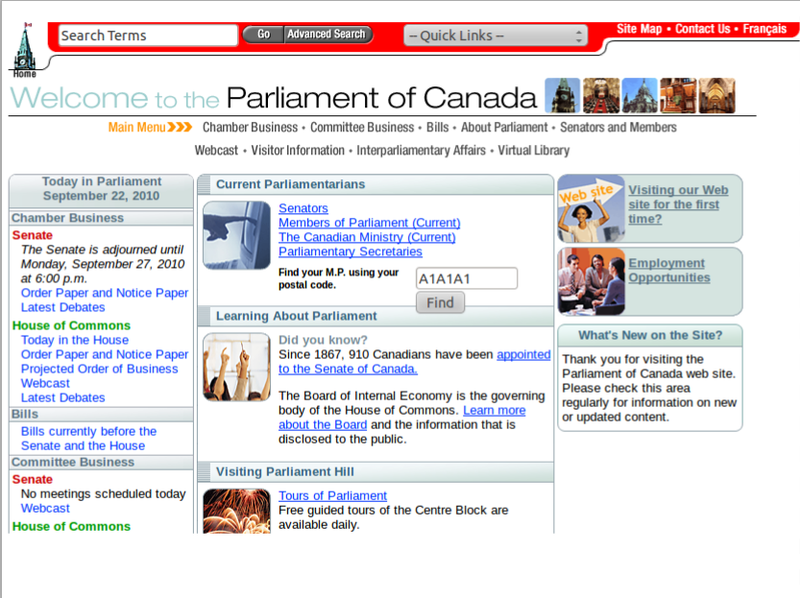 Just the act of presenting the same content with a new interface can be a political act. 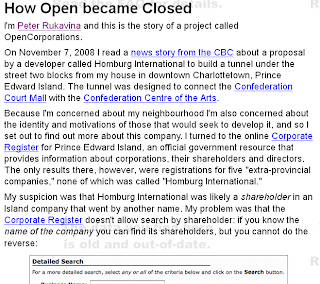 For example in 2008, Peter Rukavina spidered the PEI’s Corporate Register and indexed it so that anyone could search the database by company shareholder. He did because he was concerned about a developer’s plan to build a tunnel in his neighbourhood and he wanted to learn more about other corporations that might be involved and there was no way to search the database this way, even though the information was available. The provincial government did not look kindly to this enhancement and quickly took steps to prevent Peter’s database to make regular updates, effectively ending the service. CrisisCommons’ is “we connect people to help those in need”. 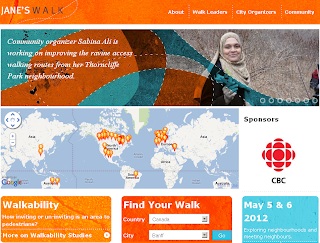 Longer version: "connecting people, tools & resources to support crisis response"
Ushahidi: “we are a non-profit tech company that changes the way information flows in the world”. Part of the longer version: “We build tools for democratizing information, increasing transparency and lowering the barriers for individuals to share their stories." 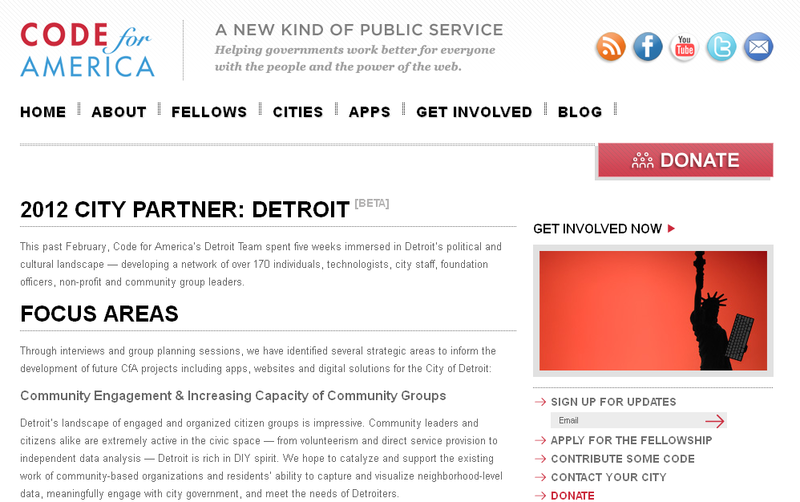 Open government groups and organizations are dedicated to improving the wellbeing of all citizens, increasing community capacity, and reducing digital divides. Just like libraries. 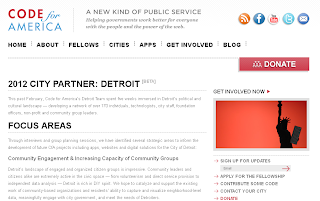 And just as I’ve always been more inclined to host and participate in events rather than writing about how other people are hosting and participating in events, I find that I want to build up my computing skills so I can help code and connect the work of these organizations with that of libraries. In fact, I am beginning to think that I would love to spend a year learning and doing just that. Speaking of events, I very much appreciate this opportunity to speak to you today and want to thank Selinda Berg for taking the initiative and making this possible. And I thank you for attention. I hope not too much of what work I have described was new to you as I try to capture my ideas and my work in my blog New Jack Librarian as I go along. If you have been reading my blog, you might be more aware of connections in my work and my interests that I’m not aware of. If so, I’d love to hear it because while this presentation has done much towards my goal of creating a new lens to see farther than I can today, the future is still a little blurry to me.